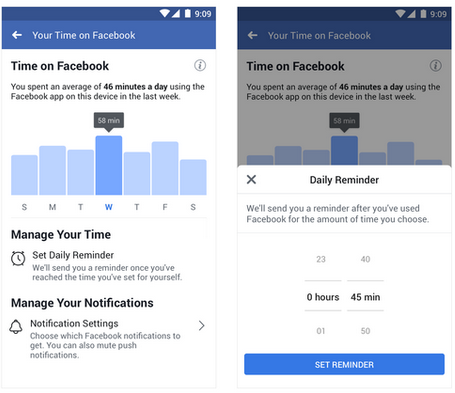 Facebook has launched a new set of time management features to help users reduce the amount of time they spend on social media. The company launched the new tools for FB and Instagram platforms. How Do I Access The Tool on Facebook and Instagram? To access the tools, go to the settings page in both app. 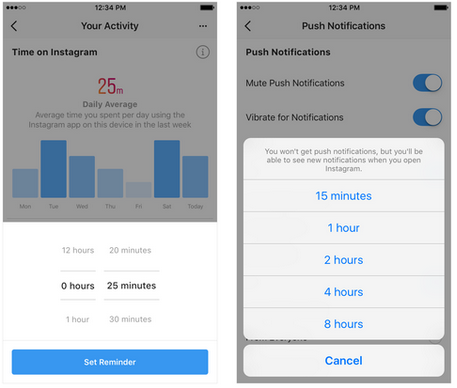 Instagram users should tap “Your Activity”, and FB users should tap “Your Time on Facebook”. Users will now be presented with an average time for that application on that device, along with a dashboard which allows them to customize their social media experience. Below the dashboard, you can set a daily reminder to give yourself an alert when you’ve reached the amount of time you want to spend on that app for that day. You can change or cancel the reminder at any time. You can also tap on “Notification Settings” to quickly access the new “Mute Push Notifications” setting. This will limit your Facebook or Instagram notifications for a period of time when you need to focus. How many hours do you spend on FB and Instagram daily? How much data do you consume on your social media daily? I don’t think it will caution time spent, cos you may decide to set it to 1hour now and after getting the notification that your time limit is up, you may either ignore or edit the time again. I support this new feature, to check mate time spent on social media. It’s so important at time when a lot of us lack time management. For the social media addicts. But this is still within their control. Good for those who need it. Facebook these days is dry, so using a time management feature for it seems weird. Instagram on the other hand is one app I know requires the feature highly! Nice one. This will help. Spend little or more time on insta and fb. this won’t work for me.